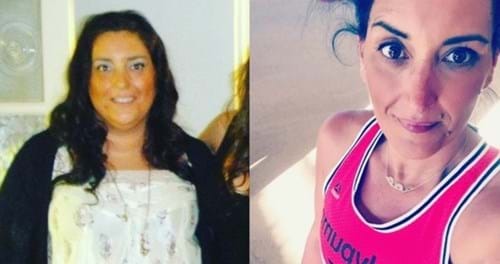 Four years ago I had to go to a routine doctor’s appointment I was weighing in at 17 stone 10lbs (248 lbs, or 112 kilos) – I was told if I didn’t lose weight my health was really going to suffer. I had high blood pressure, painful joints due to the excess weight I was carrying, and a high risk of getting diabetes. If I walked for longer than 10 minutes I was in pain and out of breath. When I left the doctors I decided to change my lifestyle. First off, I looked into nutrition and changed the way I ate. After losing 24 lbs I decided to try exercise. I had never been in a gym in my life, so it was very scary. With the help of a personal trainer I began a light exercise programme which in time was increased as I got fitter. I really depended on the personal trainer because I needed somebody to push to me. One day he told me he was leaving the gym I went to, as he was changing his career. This was a massive blow to me. I kept going to the gym, but really didn’t have the motivation and began to lose interest and stopped going as regularly as I had been. Another gym member had suggested trying group fitness classes. Immediately I said there was no way I would go because I felt so self conscious because I was overweight. My impression of group fitness classes was that everyone would be extremely fit. But eventually I was persuaded to try, so I geared myself up and went to BODYATTACK™. I was a bag of nerves and about five minutes into it I thought I had made the worst decision ever. I was looking for the nearest exit to escape. By the time the class ended I was out of breath, soaked in sweat, I thought I was going to die … but I did it! From that moment my love for Les Mills grew. After a few weeks of going to BODYATTACK I really started to enjoy and look forward to it. Then one night I went to class and found out our Instructor had injured himself. The class was being replaced with BODYCOMBAT™. Again, I was nervous – I looked for that escape door again. The instructor asked if there was anyone new in class. I cringed, as I was the only one to say yes. Everyone in that room was a regular. The Instructor came over and introduced himself to me as Anthony Rutherford – everyone calls me Tony, he said. He took a couple of minutes and gave me a briefing of what the class entailed, told me to take it at my own pace and, if it got too much, to step out after the fourth track and build up to a full class over time. Immediately I felt at ease. Tony came up to me at the end and asked how I felt, if I liked it and would I come back? I had told him about my journey to lose weight and that I really wanted to work on my fitness. I asked Tony if he did personal training, as I felt I needed that discipline. His reply was, you don’t need a personal trainer. Keep coming to BODYCOMBAT and start coming to BODYPUMP™ – I will coach you. Another new class! Again, I had this impression of bulked up men and women lifting massive weights. My mind was soon put at ease. For my first BODYPUMP class Tony took a few minutes before class and went through techniques with me; I was given a bar only and told to concentrate on technique for the first couple of classes. Before and after every class Tony would take a few minutes to talk to me, and over time what weight to put on my bar. No longer was I allowed to hide at the back of studio in BODYCOMBAT – I got moved to the front so Tony could see me. In a matter of weeks my whole body shape began to change. I was losing weight more consistently than I had been, I started to feel better about myself, but more than anything I was enjoying myself. Tony knew I wanted results and it was results I was getting. After classes Tony would take 10 minutes with me to see how I was feeling, maybe go through a technique with me – his coaching was invaluable. I fell in love with Les Mills classes, I got excited for every new release, spent hours on YouTube watching Rachel and Dan, studied sizzlers, and practised in my lounge area at home. When anybody new joined a class it gave me great excitement – excitement because of what those classes and Tony had done for me. Fast forward to now and I am a different person. I’m down to 10 stone, 10 lbs (140 lbs, or 64 kilos). I have gone from being in agony walking, to being one of the fittest in my studio. I have been to many classes in many different studios, but Anthony Rutherford is by far the best Instructor I have ever come across. A fantastic coach makes a difference. He knew I wanted results, and results I have got. His passion for Les Mills has been passed onto me and in the last few months I’ve decided to set myself a goal – to work toward becoming a BODYCOMBAT Instructor. Still to this day I am coached in classes by Tony – he pushes me and motivates me. He took me under his wing when I was struggling and has taught me the hows and whys of everything that’s done in each class. Now I do four BODYPUMP and four BODYCOMBAT classes each week. I don’t think I would ever have got this far if it wasn’t for Tony and his passion for Les Mills. So, I must thank you for such a fantastic Instructor and also for giving me a healthier and happier life. The new releases are amazing and are making me love the classes even more! 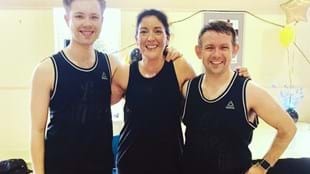 Yes, I’m a total geek for anything Les Mills, my family and friends know to buy me the Les Mills clothing for birthdays and Christmas – and I’m no longer an unhealthy couch potato. Louise Duffy lives in Glasgow. She has been attending Les Mills classes for four years.